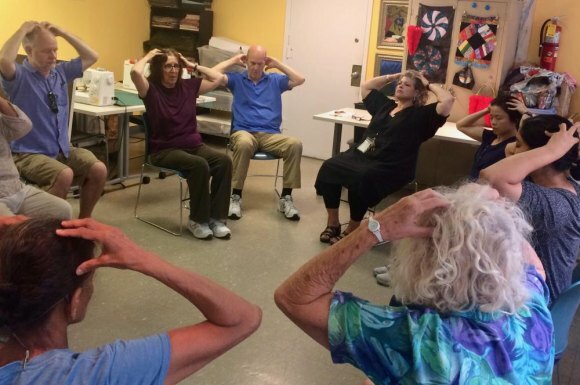 Among classes at the CBN/RI Senior Center, "Mindfulness Meditation with Prafulla" fills the room. It goes without saying that RIOC's Public Purpose Grants, more generous than ever this year, ought to be balanced, fair and awarded without significant bias. But what we see coming out of this year's Common Council deliberations is disgraceful, pitting young against old in a way that should make anyone over 60 wonder if they're still welcome in this community. Here's the lineup of recommended giveaways the Public Purpose Fund Committee submitted and the full Council approved. To get there, the committee slashed the Carter Burden Network's request of $20,000 by nearly 85%, a savage reduction not suffered by any other applicant. On a day off, CBN's Director Lisa Fernandez pitches in with Disabled Association to serve Thanksgiving dinners to needy residents. This does not take into account $800,000 set aside by RIOC for the Youth Center, nor does it recognize a possibly illegal giveaway of proceeds from the weekly Farmers Market that RIOC lets the PTA collect with no competition and with almost no responsibilities attached. To be fair, a substantial difference was inevitable because CBN is the only nonprofit seeking funds for seniors while several others represent youngsters, but 16 to 1? And getting there by drowning a request as if it was trivial? In 2016, finding thefts, mismanagement and neglect extensive at the Roosevelt Senior Center and the operator unfit to continue, the City's Department for the Aging, primary funder of Center activities, canceled a contract with the Roosevelt Island Senior Association, without prior notice. On the recommendation of City Council Member Ben Kallos, they asked the Carter Burden Network to come in as an emergency replacement. CBN has an impeccable record for serving seniors since being founded by Carter Burden, then a City Council Member, in 1971. It made them a smart choice for rescuing a Senior Center off the rails. But the transition was far from clean. Its contract with DFTA terminated for cause, its Program Director on her way to three felony convictions in a plea deal, RISA, aided by local media, supported a tale that their contract had simply not been renewed. 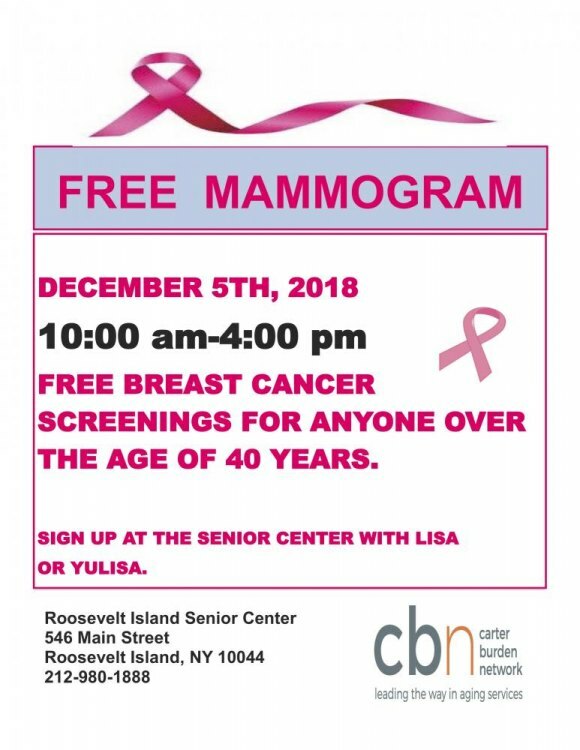 CBN hosts free breast cancer screenings, next month. DFTA, it was implied, summarily dismissed a valued local nonprofit in favor of an outsider, a comparative giant. RISA never explained what happened - and its not our purpose to go down that road again here - nor did they apologize to seniors in the community for what turned out to be more than a decade of neglect. This allowed Roosevelt Island's traditional dislike for "outsiders" to fester in a campaign against CBN. CBN, for its part, refused to push back, even when shown evidence of efforts by RISA and friends to undermine their work at bringing the Center up to standard. Scandals generated by RISA went unreported until its ousted Program Director coped a a triple felony plea in court. And not just that, RISA's management was given free reign in the now defunct local newspaper to cry foul and blame whistle blowers, not themselves and their Program Director, for their predicament. Public opinion turned against the Carter Burden Network, inspired by false reporting and malicious rumors. Not surprisingly, RIOC got into the act, responding to intense local politicking by RISA administrators, approving a Common Council recommendation of $15,000 in Public Purpose money for the not yet fully exposed group. And $3,000 for Carter Burden. RIOC ineptly, then, changed rules and extended time lines exclusively for RISA in trying to get them the money for which, it turned out, they were not legally qualified. While most of those involved were unwilling to talk on the record, we heard from three of the four Public Purpose Fund Committee members and others on the Common Council where the recommendations were considered. It became abundantly clear that the Committee was not simply uninformed about CBN, but they, along with the full Common Council, were contaminated with bias. 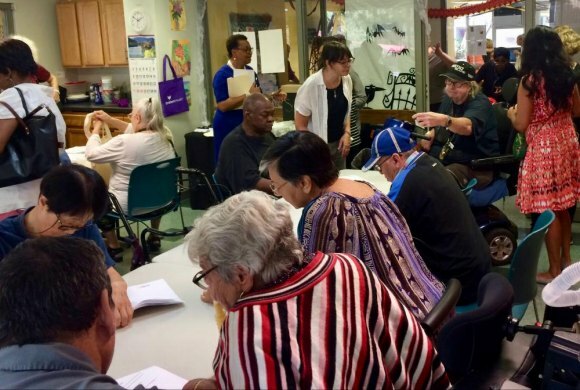 AdvantAge Survey: CBN teams with the Visiting Nurse Association in a comprehensive effort to discover unserved senior needs. In one chilling conversation, a Common Council Member critical to decision making on Public Purpose Funds told me that all (s)he knew beforehand was that CBN was "taking advantage of Roosevelt Island." Where do you suppose that came from? Another answered my inquiry with this: "The deterrent to more *Island Money* is the perception/belief that CBN is a loaded $$$ organization and, as such begs the question as to why they would/need to take money away from relatively poor Island 501(c)s."
But that's not supposed to be the standard, is it? The standard is service to Island residents that would not otherwise be available. CBN wanted to pay its current roster of instructors a little more than DFTA allowed and add some new programs. One Committee Member willing to go on record made the defense for snubbing seniors worse. In freely submitted comments on an article published by The Daily, Frank Farance twice referred to CBN's Roosevelt Island contract with DFTA as "profitable," a ridiculous claim which, if true, would mean CBN violates the City's rules for funding. All nonprofits are in the same situation. They're all equally poor, no matter their size or goals. In a similar vein, Farance alluded to CBN's "$300,000 to $400,000" contract with DFTA - it's really only $315,000 - as if that alone was enough to exclude them from Public Purpose money. But that's a little like saying the Sierra Club's powerful fundraising on behalf of the environment somehow disqualifies them from raising more, with no consideration given to needs or projects in the works. 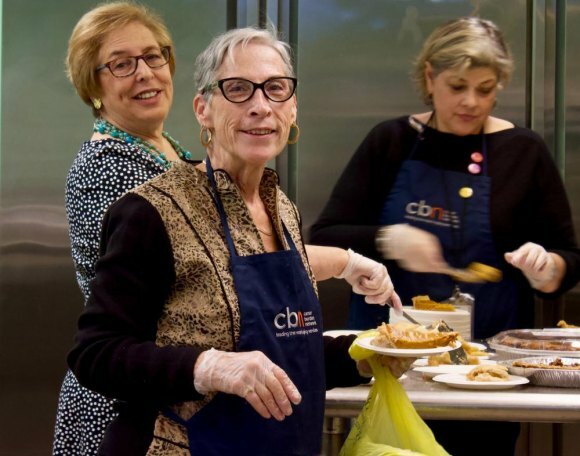 By contrast and for enlightenment, before getting themselves kicked out of the Senior Center, RISA got the same $315,000 grant from DFTA, with far less benefit to the community, but the Common Council, year after year, recommended 4 to 5 times as much as they recommend for CBN doing the same work. Ridiculous claims prove overwhelming, unfair bias against the Carter Burden Network that results in slamming seniors as if they were undeserving intruders at the border. 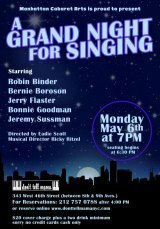 RISA and friends, several closely associated with or active members of the Common Council, continue politicking against CBN, hoping to force out the "outsiders" who've served Roosevelt Island well. A major goal, we've learned, is not to help seniors but to convert the space into a "Community Center," a term already in use by RISA. Before RISA choked itself with thefts and an avalanche of forgeries, some well-known local names had already mapped out office space for themselves in the Senior Center, planning to downgrade the space by taking away its exclusive use by seniors. A good part of their anger came from losing privileges they expected to claim for themselves. This has so tainted the Public Purpose Grant process that the Common Council's recommendations must be tossed out. Given the background work already done by RIOC along the way, a redistribution of the money should not be difficult or time-consuming. Decisions about it must now be handed over to fair-minded, objective observers not polluted with bias and behind the scenes politicking among longtime friends and associates with questionable motives. The Carter Burden Network and, by extension, Roosevelt Island's elderly deserve better. The results so far are a stain on the community. Even other nonprofits in competition for the limited funds were aghast at the recommendations. We haven't come to expect RIOC to routinely "do the right thing." They usually are differently motivated. However, we can only hope that this situation is so extreme it brings out the best, something at which the Common Council failed miserably. An earlier version of this article included a $14,500 grant to iDig2Learn as money funded exclusively for children. That was inaccurate. iDig2Learn intends to use the money for multiple ages. See this article.